Chowkidar Pragati Jain 🇮🇳's tweet - "Arrogance level: MAX It’s now time to boycott both @KapilSharmaK9 & @SonyTV until they remove this terrorist apologist @sherryontopp pig. #BoycottKapilSharma @TajinderBagga "
Iska khud ka management toh ho nhi pa rha. Kitni baar toh correction centre mai reh chuka phir bhi nhi sudhara. Gira hua insaan hain na koi izzat hain par doosro ko gyan dene main awal hain. Khud ki samajh ghatiya hain toh vaisa hi bolega yeh gadha. We don't expect @KapilSharmaK9 to give such irresponsible statements. Many people doesn’t know Kapil Sharma was sometime ago and he was under medication. It seems he is not fully recovered. We should let him take rest. As regards Sidhu, his life is waste n cursed one. Not one single soul in India want him here except some Congress chamchas. Purani kahawat hai "kutte ko ghee hajam nahi hota " kapil ke sath bhi yahi samashya hai. I request everyone to #BoycottKapilSharmaShow #BoycottKapilSharma until they kick siddhu out of their show. 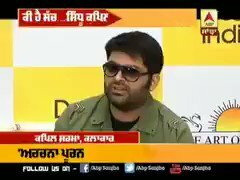 This is not arrogance.. this is his point of view which he is very much entitled to as much as you have.....It's a free country and will always remain and all are entitled to their views and choices :)..
Kapil sharma we love our Soldiers not Gaddar Siddu & now You, Apna shown apney ghar mey chalao. We salute to our all Shahdi and with them. Is gadhe ki dekhte kyon log? Boycott Karo aur dikhado isko apni aukaat. Completely boycott them . I hv unsubscribed @SonyTV . Saara arrogance Hawa ho jayega agar log inke show ka total boycott Kar den bas 2 week Tak...aukat mein aa Jayenge. I have already removed sony tv frm list of my favorite channel. We cannot expect goodness from ppl who earn money by mocking othrs. Further hav urged my frnds to boycott jokers and daily soap ppl, they can never distinguish betwn reel life and real life. if sacking sidhu is not solution than we citizen of India will sack you and your show & throu in to dustbin. do not underestimate the power of common man. Jo sach bolay usy ban kar do. Good solution. straight away unsubscribe sony TV, #BoycottKapilSharma #BoycottKapilSharmaShow Will be automatically done. Yeh choti choti चीजों se hi badlaav laya ja sakta hai. Desh ke against jo galat karega ya kahega uska बहिष्कार karna chaiye. Either any one.... Thats all Jai Hind. Is Kapil Sharma ko zyada charbi Chad gayi hai! Two tupence comedian. Will no longer see his show! My family love #KapilSharmaShow and do not miss it. But now, after watching this arrogant @KapilSharmaK9 , she has taken vows not to watch @SonyTV any more. jab ye ek ghar m band ho gya tha. #boycottkapilsharma sidhu pak ka sath de raha hai yeh pareshani hai hume. If he is earning and living in India why he insulted CRPF jawan which were killed by pakistani terrorist. Kapil u have lost it. Yeh choti moti baat nahi hai. Rastrawad kise kehte hai jawan se ja kar puchoo. Now even if they remove the 🐕 @sherryontopp, this video of @KapilSharmaK9, proves him to bigger a 🐕. Arrogance to tumhara hai jo is nalayak sarkar se sawaal nahi puchte ho . Not only #BoycottKapilSharmaShow but kicked him out from India also. You think he knows what is he talking , looks high on cocaine thanks to his friends across border idiot . I was an ardent fan once, but stopped watching after he forgot his humble beginnings, assumed he is a star, fought with friends and started drama. I do NOT watch this scum’s programs anymore. Kyu?? Arrogance pe sirf bjp walo ka copyright hai kya?